Discourse around refugees remains bleak. When they are not seen as a burden to public finances and a potential threat to Western social norms, refugees are usually portrayed as powerless victims in need of charity. But this narrative, laden with misconceptions, fails to acknowledge the economic potential refugees bring, and their ability to rebuild their own lives with only some guidance and support. 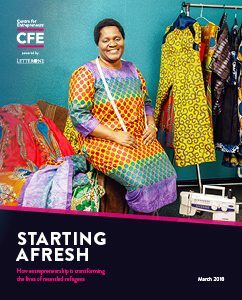 In “Starting Afresh: How entrepreneurship is transforming the lives of resettled refugees”, the Centre puts forward a compelling case about why refugees make great entrepreneurs, how they can contribute to the UK as business-creators, and how guiding them towards entrepreneurship can reduce public spending and strengthen social integration. Each refugee generation to reach the UK has produced business leaders that have created lasting brands, and along with them thousands of jobs. Michael Marks of Marks & Spencer and Montague Burton of Burton Group had to flee the Russian pogroms in the late nineteenth century; in the 1950s, Lakshmishankar and Shanta Pathak escaped Kenya to set up the Patak’s curry brand; and Indian-Ugandan refugees are behind the likes of Tilda Rice and Euro Car Parts. Refugees arriving as late as the 1990s have already created multi-million pound businesses, such as co-founder of Firezza, Edin Bašić, who we profile in the report. All of this should not come as a surprise: evidence suggests that those fleeing persecution display personality traits that are key to business success, such as high confidence and motivation, a keen perception of risk, and strong desire for achievement. Meanwhile, our analysis shows that making business support available to all 20,000 Syrian newcomers expected by 2020 could save the taxpayer £170m over a five-year period, at the cost of just £4.8m; this would constitute a 35x return on investment. Add this to the increased tax revenue and regional economic growth that follow new business formations, and the economic case for refugee entrepreneurship becomes clear. In light of the above, the report offers tailored recommendations to government, business and the third sector about how best to harness the entrepreneurial potential of refugees: with a new strategic vision for resettlement, a mobilisation of the business community and the roll-out of refugee entrepreneurship programmes across the country (models of which we present in the report), the UK can make refugee resettlement a win-win situation.